I just got caught up on the latest episode of The Walking Dead. After watching each episode, I have to come down from the wave of excitement over what happened. Who died? Who is sick? Who has changed the most? How many times did I wish that Carol and Daryl would get it on already? My husband and I have to discuss it like we are gossiping about the popular girls in high school.... it is that sad. And five years ago, I wouldn't have been interested in a sci-fi show let alone a zombie show. Now, well, I LOVE ZOMBIES. I'm pretty much addicted to everything zombie at the moment. Tonight I started to think about why I like the show so much. It hit me.... 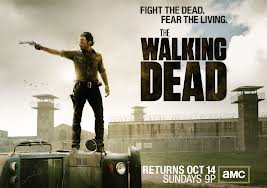 The Walking Dead is a Southern Gothic tale. The situations that these people are put in, forced to make less than humane decisions just to survive is grotesque. The true nature of human beings when stuck in miserable situations -- people still hook up, people still laugh, people still grow.... life goes on, somehow. The gritty cinematography certainly helps, I can nearly count the sweat beads on Rick's brow, smell the illness of sick rotting in the cells, and feel the pain in each tired step they take trying to survive. The music is also outstanding. I heard Ben Howard's Oats In The Water on the episode tonight and it was perfect for the scene as people are dying of the sickness that has hit the prison. Ben Howard reminds me of Damien Rice with a stronger voice. The mood that was set was of despair and sadness but also of strength and I loved that. I don't know of many movies that can capture a moment as well as The Walking Dead did. Lastly, I'll admit it... Daryl is my favorite. 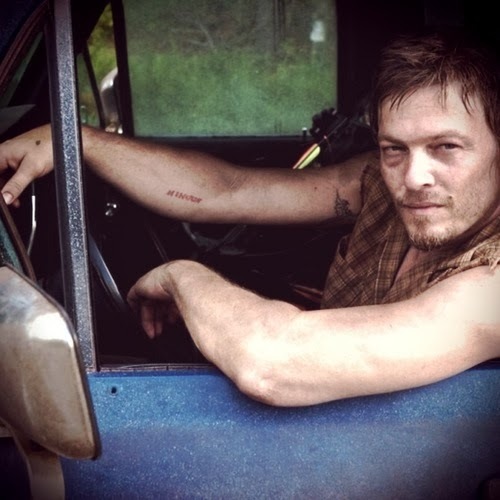 I like Carol too (obviously) but this picture of Daryl just sums it up -- redneck, grit, vintage, survival... it is the essence of the southern gothic.